1. With a group of 4 people travelling, the fifth person travels for free. Tickets should have the same route, same dates, and the first leg of flight should be before the 30th of June 2017. 2. Infants under 2 years travel for free – first flight should be before the 30th of June 2017. 3. 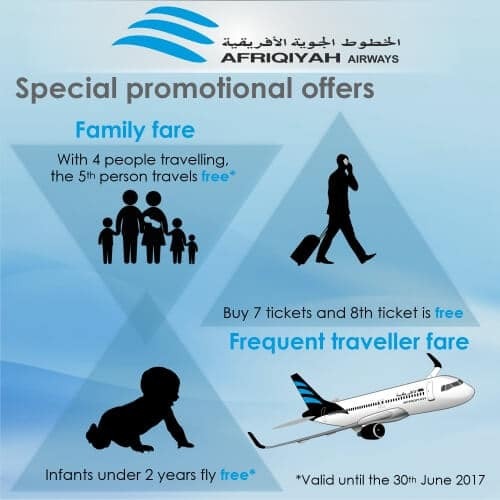 For frequent travellers: With any 7 tickets of Afriqiyah Airways bought during 2017, the 8th ticket is free. Kindly keep a copy of all purchased tickets as reference. 4. Terms and conditions apply. Our flights team is available on [email protected] or +356 2133 1010 to assist you through with regards to these offers, bookings and any other travel service you might require. Next Next post: Ryanair selling connecting flights!